Some Chinese businesses in Toronto are questioning the effectiveness of a potential city-wide ban on shark fin without strong federal action. A proposed shark fin ban in Toronto has some Chinese businesses around the city grappling with the associated ethical concerns, while at the same time questioning whether a municipal ban alone is a worthwhile initiative. Toronto councillors John Parker, Glenn De Baeremaeker and Kristyn Wong-Tam launched a campaign on Monday aimed at banning the sale and consumption of shark fins within the city, citing unethical practices like shark finning, which is illegal in many countries, including Canada. Shark finning involves hacking off the sharks' fins and throwing their still-living bodies back into the water. Groups like Oceana and WildAid say up to 73 million sharks a year are killed, primarily for their fins. De Baeremaeker said he hopes other regions will follow Toronto's example and such bans will be "replicated across the nation." Shark fin soup, however, is a fixture at Chinese wedding banquets and other significant cultural events. Even small grocery stores in Chinatown sell canned shark fin soup. James Ko, the general manager of Casa Imperial Fine Chinese Cuisine, is skeptical of the effectiveness of a city-wide ban on shark fin. His restaurant is known for its dim sum and high-end wedding banquets finished with shark fin soup. "Unless it's nationwide legislation, I don't see how it can effectively end the illegal shark hunting," he said through a translator. "Meanwhile, look at the food on our table. Can we guarantee every cow, chicken, pig, fish was not slaughtered inhumanely? Should the killing of these animals be all regulated?" "If Toronto passes the bylaw, it simply means people will just cross the street to other cities like Markham, for shark fins," said Ko, whose restaurant is located at the southeast corner of Steeles and Warden Avenues, on the northern limit of the City of Toronto and just south of Markham. Ko estimates he could lose up to 50 per cent of his business if the ban is passed. A scan through the menus at some Toronto restaurants serving the item shows the prices for a small bowl of soup range from $25 to $100. Michael Zhao, who manages the Golden Regency restaurant inside Pacific Mall in Markham, told CBC's Lu Zhou he has been following the debate over the use of shark fins, even though his restaurant wouldn't be affected by a ban in Toronto. He said he tries to convince his customers to substitute shark fin soup with other seafood or meat. At weddings, he said he finds the brides and grooms can be easily persuaded, but their parents and grandparents have a harder time giving up the cherished menu item. In downtown Toronto, seafood product store owner Ken Leung is weighing the merits of a potential ban. 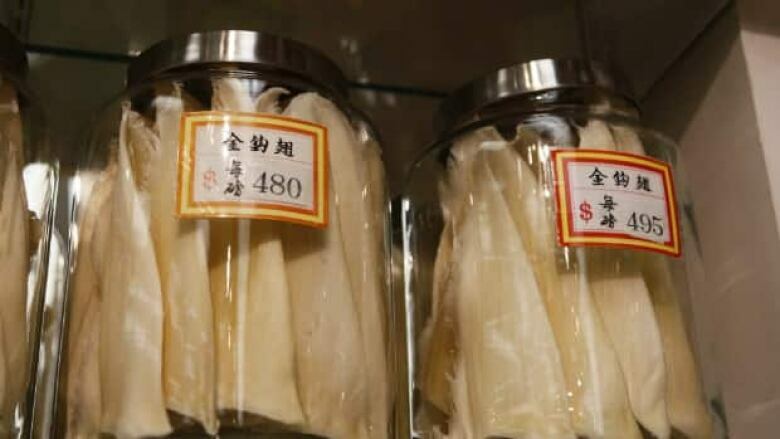 Leung has been importing and selling shark fins for 18 years from his store in the Dragon City mall, at the corner of Dundas Street West and Spadina Avenue. His tiny store can easily be mistaken as a regular convenience store, with colourful Chinese snacks stacked on shelves and lottery tickets for sale at the front. But in the back of the store, there are six massive dried shark fins on display, each about one metre long and half a metre wide. Leung said he bought the fins 10 years ago in Norway when they were much cheaper — they only cost $10 a pound then. Now they cost $600 a pound. "But what hasn't changed is at large fishermen's markets, everyday, different parts of sharks are auctioned but only after whole sharks are brought in to the market. You can't just enter the market with fins alone," he said through a translator. "I don't think it's fair to launch a full ban only because a small group of people harvest sharks inhumanely," said Leung. "Shouldn't we address the practice of shark-finning first, strengthen conservation efforts, increase penalties for illegally killing sharks, before we ban shark fins? " Both Leung and Ko agree that educating the public about inhumane finning practices is a step the city should consider. At the Pearl Harbourfront restaurant in downtown Toronto, shark fin has been taken off the menu due to public pressure. 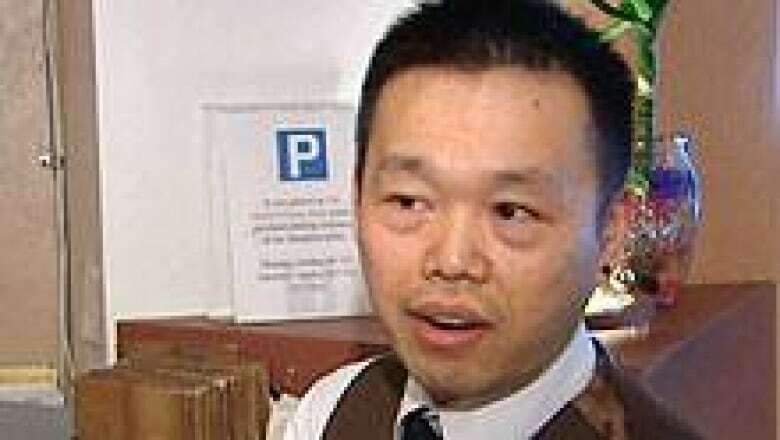 "Because most of the Canadians they keep calling us, they are telling us don't do that," said Kim Mak, the manager. But shark fin soup is still available on request, and is still a money maker, said Mak, who estimates losses of up to 30 per cent if the restaurant stopped serving the item altogether. De Baeremaeker will introduce a motion at council on Wednesday seeking the ban, which could be in place by next year. Brantford, Ont., passed a similar ban earlier this month, becoming the first Canadian city to do so.